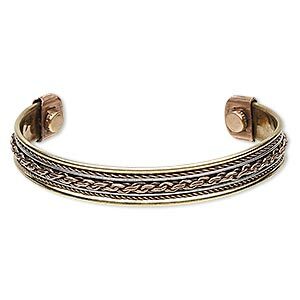 Bracelet, cuff, brass / copper / steel, 11mm wide with beaded and twist design, adjustable with magnetic ends. Sold individually. Item Number: H20-6710JD Have a question about this item? 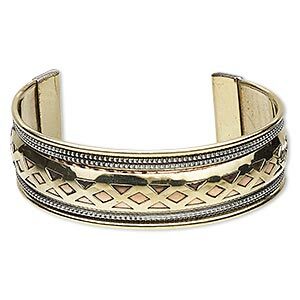 This bright cuff adjusts to fit a range of wrists and looks great stacked with other bracelet designs. 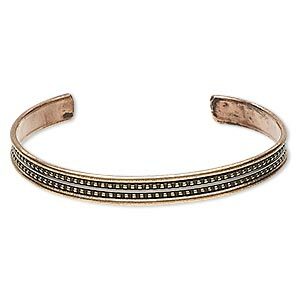 This bracelet's contrasting brass, copper and steel make for an attractive design that will be a quick-selling addition to your jewelry lines. Features a round magnet at each end, which are believed to provide relief to achy joints. Light magnetic strength. 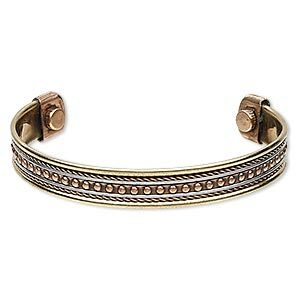 Bracelet, cuff, brass / copper / steel, 11mm wide with twist and beaded design, adjustable from 7-1/2 to 8-1/2 inches. Sold individually. 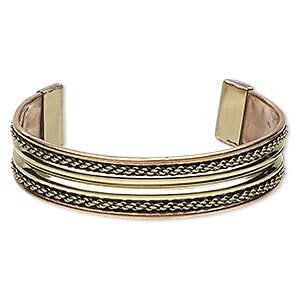 Bracelet, cuff, brass / copper / steel, 12mm wide with twist and chain link design, adjustable from 7-8 inches with magnetic ends. Sold individually. 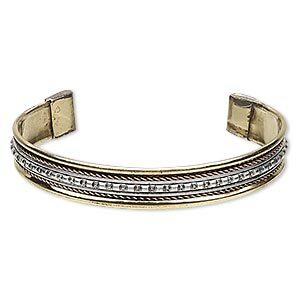 Bracelet, cuff, brass / copper / steel, 22mm wide with diamond cutout design, adjustable from 7-1/2 to 8 inches. Sold individually. 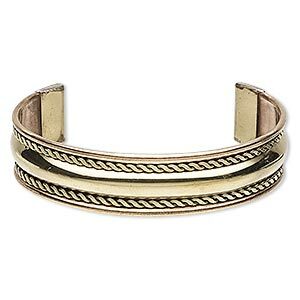 Bracelet, cuff, brass / copper / steel, 17mm wide with flat twist design, adjustable from 7-1/2 to 8 inches. Sold individually. Bracelet, cuff, brass / copper / steel, 16mm wide with chain link design, adjustable from 7-8 inches. Sold individually. 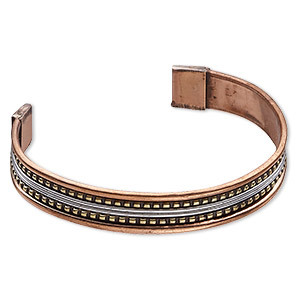 Bracelet, cuff, brass / copper / steel, 8mm wide with beaded design, adjustable from 7-1/2 to 8 inches. Sold individually. 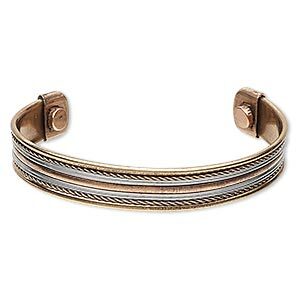 Bracelet, cuff, copper and steel, 12mm wide with twist design, adjustable from 7-1/2 to 8 inches with magnetic ends. Sold individually. 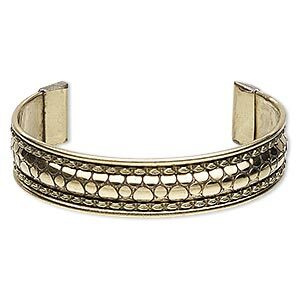 Bracelet, cuff, brass and steel, 16mm wide with circle design, adjustable from 7-1/2 to 8 inches. Sold individually. Bracelet, cuff, brass / copper / aluminum, 11mm wide with beaded and lines design, adjustable from 7 to 8 inches. Sold individually. 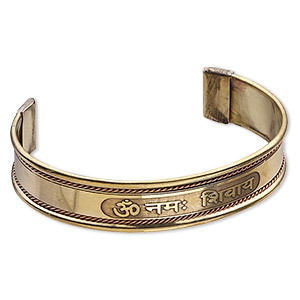 Bracelet, cuff, brass and copper, 15mm wide with rope design and "om namah shivaya," adjustable from 7 to 8 inches. Sold individually.